Another area of interest for my students and me is the question of whether there might be habitable worlds around other stars and, if so, whether any of them might actually be inhabited. Our models of how climate evolves on terrestrial planets suggest that the liquid water habitable zone (HZ) and the 4.6-b.y. continuously habitable zone (CHZ) around the Sun are relatively wide, of the order of 0.5-1 AU (Kasting et al. 1993). The same appears to be true of other F, G, and early K stars (Fig. 1). This conclusion contrasts with earlier calculations by Michael Hart (Icarus, 1978, 1979) which suggested that the CHZ was relatively narrow around all types of stars. The primary difference between our conclusions and those of Hart is our inclusion of the negative feedback between atmospheric CO2 levels and climate by way of the carbonate-silicate cycle (Walker et al. 1981). Fig. 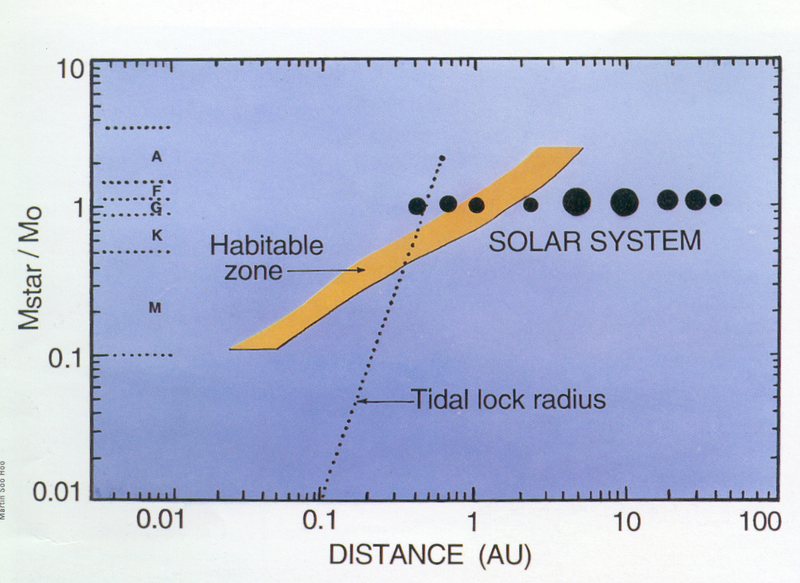 1 Diagram illustrating the zero-age-main-sequence habitable zone around different types of stars. Mstar/M0 represents the mass of the star divided by the mass of the Sun. Our Sun is a G2 star. The distance scale is in astronomical units (AU). The nine planets of the Solar System are shown in black. The dotted line represents the distance at which a planet's rotation would become tidally locked to the star in a time period of 4.6 billion years. Planets orbiting late K and M stars (red dwarfs) would be subject to this problem. For the more massive blue stars high UV fluxes and a short main sequence lifetime are the main problems. The carbonate-silicate cycle, which plays a key role in stabilizing Earth's climate over long time scales, is shown in Fig. 2. The cycle begins when atmospheric CO2 dissolves in rainwater, forming carbonic acid, H2CO3. Through a process termed "weathering", this weak acid dissolves silicate rocks on the continents, releasing Ca++, Mg++, HCO3- (bicarbonate), and SiO2 (dissolved silica) into solution. The products of weathering make their way down to the oceans in streams and rivers. There, organisms such as the planktonic foraminifera that live in the surface ocean use them to make shells out of calcium carbonate (CaCO3). When the organisms die, they fall down into the deep ocean, where most of the shells redissolve. Some of the calcium carbonate survives, however, and is buried in sediments on the seafloor. The seafloor spreads from the midocean ridges and, at some plate margins, is carried down subduction zones. The carbonate minerals recombine with SiO2, which by this time is the mineral quartz, to reform calcium and magnesium silicates and release gaseous CO2. 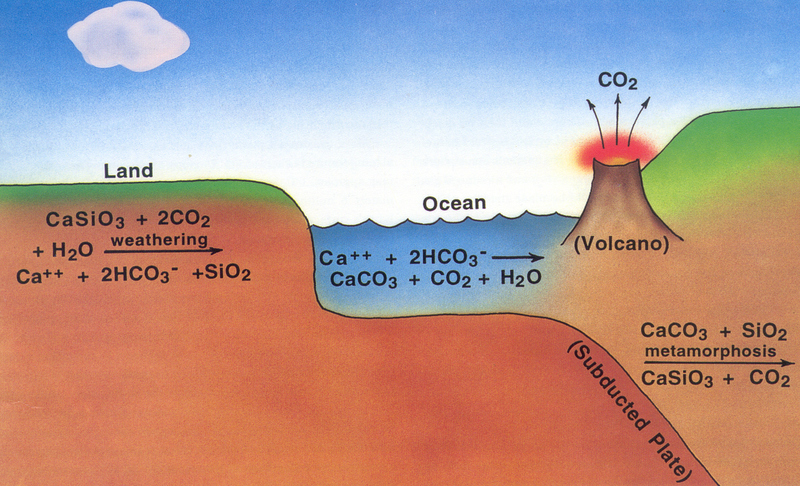 This CO2 is vented into the atmosphere through volcanoes, thereby completing the cycle. The stabilizing negative feedback in the carbonate-silicate cycle is produced by the dependence of the silicate weathering rate on temperature. When surface temperatures drop, the weathering rate slows down, and CO2 accumulates in the planet's atmosphere. Thus, an Earth-sized planet that had such a cycle would be expected to build up a dense CO2 and a large greenhouse effect if its surface temperature became too low. 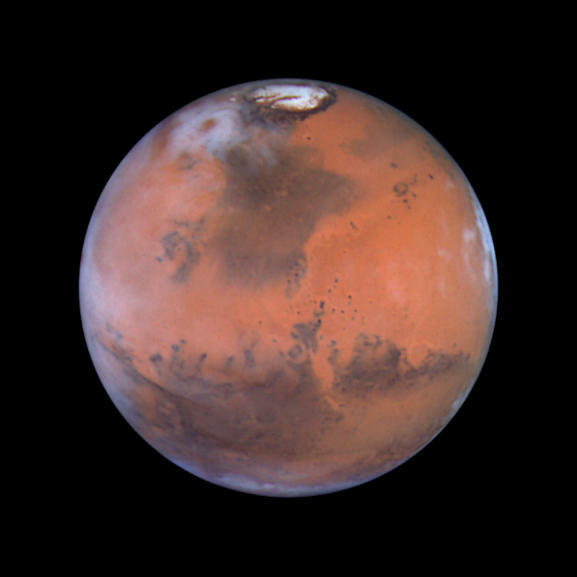 This suggests that the outer edge of the HZ is relatively far out, perhaps beyond the orbit of Mars (Mischna and Kasting, 2000). 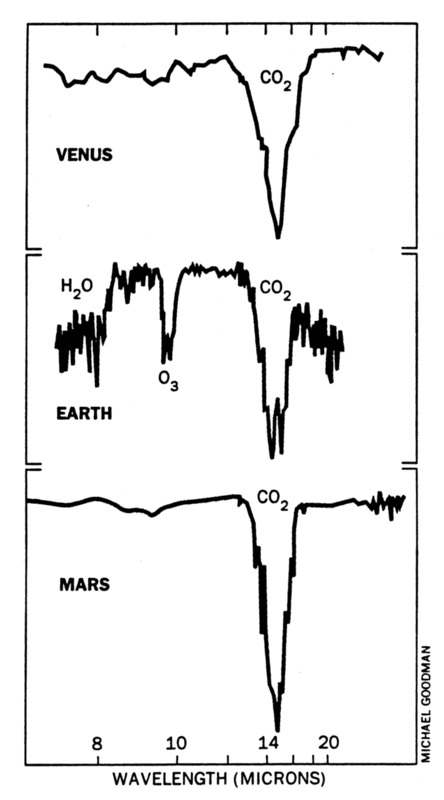 It also explains how our own planet escaped from Snowball Earth episodes in the past (Caldeira and Kasting, 1992). NASA has plans to explore nearby stars and look for both habitable planets and life. The Terrestrial Planet Finder (TPF) Mission, which is currently under development by NASA, will be a space-based telescope that will look for Earth-sized planets and take spectra of their atmospheres. 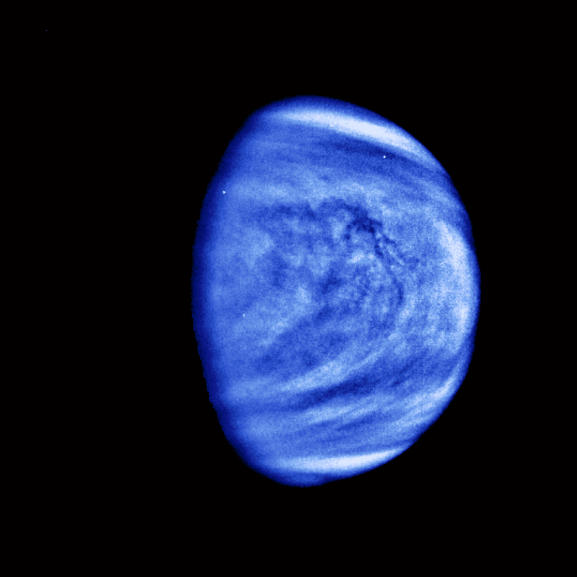 This mission could be done at either visible or thermal-infrared (IR) wavelengths, or both. In the thermal IR, it would be necessary to do interferometery, i.e., to combine beams from multiple telescopes. One idea is to put these telescopes on separate, free-flying spacecraft (Fig. 3). In the visible/near-IR, one could get by with a single, 3´6-meter mirror equipped with a coronagraph. Both missions are currently being studied. The IR interferometer may eventually be done as a joint mission with the European Space Agency (ESA), where the project goes under the name of Darwin. Fig. 3 Artist's conception of a free-flying infrared interferometer version of TPF. ESA's Darwin mission is based on the same design. 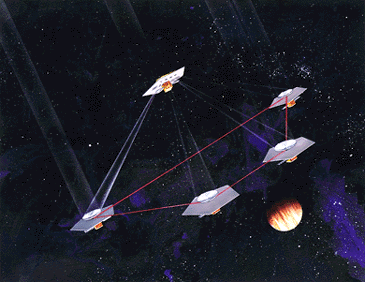 Beams from four separated spacecraft are combined at a fifth spacecraft in order to achieve high spatial resolution. The red lines between the spacecraft represent lasers that are used to accurately measure their positions. If TPF goes, it may also be possible to obtain spectra of extrasolar planet atmospheres. In the infrared, the 9.6-micron band of ozone (O3) is a potential bioindicator (Kasting, 1997; DesMarais et al. 2002; Segura et al. 2003). 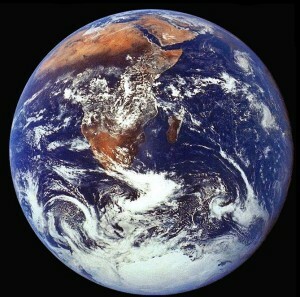 Ozone is produced photochemically from oxygen (O2), and most of Earth's oxygen is produced by photosynthesis. O2 itself is a potential bioindicator in the visible/near-IR. For early-Earth type atmospheres that lack O2, CH4 may be the best bioindicator (Schindler and Kasting, 2000). The work on bioindicators is being performed jointly with Vikki Meadows' Astrobiology group out at Caltech/JPL (http://vpl.ipac.caltech.edu). Although NASA's plans are always subject to revision, the current (summer, '04) plan is to fly two TPF missions. The coronagraph is planned for 2014, and the IR interferometer is planned as a joint mission with ESA five years later.